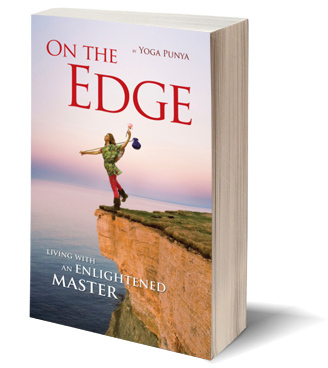 On the Edge is the absorbing story of a young woman who, driven to explore the classic question “Who Am I?”, fortuitously finds herself in India, as one of the first westerners at the feet of Osho, an enlightened mystic. His magical presence, his delightful and humourous personality, encourage her to dive into the secrets and wonders of meditation. Her vividly-described vignettes let the reader feel as if inside the commune walls, living out – alongside fellow travellers from 100 countries – the twists and turns, breakthroughs and setbacks of this unique mystery school. The heroine goes back and forth from west to east as she makes money in ‘normal’ jobs so that she can return to her beloved community; which itself moves from India to Oregon and back again. Punya is Swiss, and her research as to dates and particulars is impeccable; her voice is earnest, even-tempered, and somehow innocent, as the story unfolds, past and present skipping around, giving us a sense of timelessness. Her calm prose lights up the various landscapes like easy sunshine. For those of you who were there, this book will delight you with its clear recollections, and will likely tell you things you didn’t know. For those of you who only watched from a distance, or weren’t born yet, Punya is inviting you into an extraordinary time with an extraordinary man.